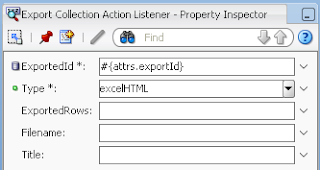 "I'm trying to use ExportCollectionActionListener inside Declarative Component, but I can't pass table export Id correctly - it gives error, Id is not found. Is it possible to make it work?" Yes, it is. 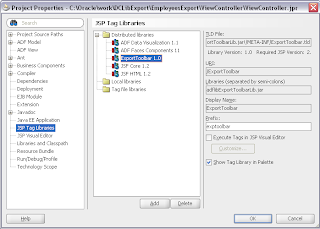 Download sample application - DCLibExport.zip. 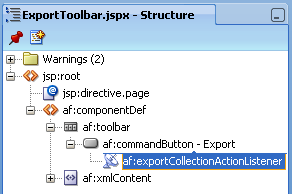 This archive contains two JDeveloper 11g applications - Declarative Component (ExportToolbarLib) and consuming application (EmployeesExport). I will not talk about Declarative Components in this post, you can read more about them from previous post. This means, we will be able to provide table Id value directly from consuming page and reuse Declarative Component in many pages. good example, but it is possible to get the "RichTable" in the declarative component (dc) by passing only the table-id into the dc? I try to create a "Clear-Table-Filter-Button" based on the steve muench code "146. Programmatically Manipulating a Table's QBE Filter Fields". I set the RichTable as a dc-attribute, but so I must bind the table in a manged bean for every use. I try to find the RichTable in der dc by passing only the table-id (like in the exportCollectionListener) but without success. I was trying same things you are describing. But, to say truth, I didn't found effective working solution. From my perspective, its good enough to pass complete table path through ID. Its similar when you are defining Partial Trigger dependency - also path to ID is included. But I want to select only few rows from the table which is in display. One more qusetion can we export to excel programatically. Its good and simple example. 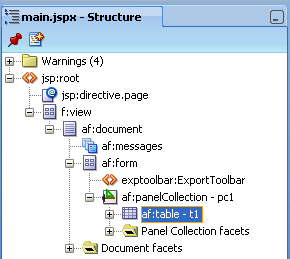 But my problem is can we export selected rows from table not using panelcollections' view-->Collumns. 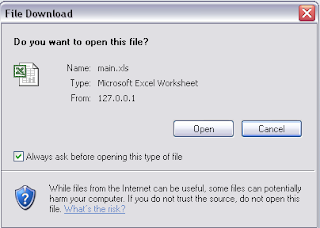 One more question can we programatically export a table into excel format. 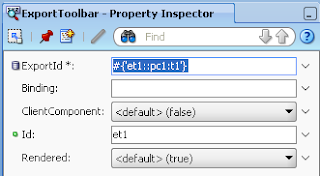 What would be the expression if the component declarative was on the toolbar facet of panelcollection? 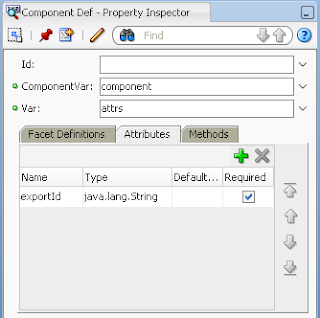 Nice one, I follow this one i am using jdev 11.1.2.3 version and i create user defined component,But i got problem in ExportID expression builder how to get this ID in expression builder..